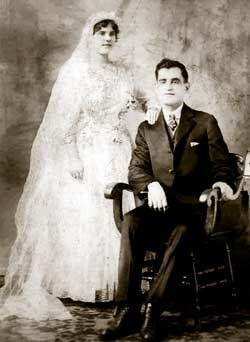 Anthony Zanetos immigrated to the United States from Greece in 1907. When he arrived in Columbus Anthony had a limited command of English, one friend and no knowledge of the business he would come to master. His first job was as an apprentice in a local candy shop in Columbus. As he learned the trade, Anthony also learned the language and began saving money. In 1916 he got the idea that what he really wanted to do was be his own boss. It would take another 16 years for him to realize that dream, but dream he did, a dream that would mold the lives of at least the next 4 generations of Zanetos. Anthony's Coop Dairy opened at the corner of Chicago Ave. and Broad Street in Franklinton in 1932. Part of Anthony's dream was to have a father and son business. In 1945 Anthony’s son Tom, returned home from service following World War II. Together they started Anthony’s Confectionary where the Coop Dairy used to be. Immediately after the war, sugar was still being rationed, but war veterans, who were in the candy business, could get a 30,000 pound annual allotment of sugar, which made Tom a valuable asset and an instant partner with his father. Tom traded some of his veteran's sugar allotment with some local Greek restaurateurs for other ingredients, which enabled them to continue making their confections. In 1947, the father-son team opened the Crystal Fountain Restaurant at 1022 West Broad Street. They expanded the business by adding ice cream making equipment, soda fountain and a lunch counter. But the star attraction was their chocolates. Soon the candy business was growing faster than the ice cream and lunch counter business. Realizing that the quality candy was creating a demand, the father-son team decided to make this their full time trade. 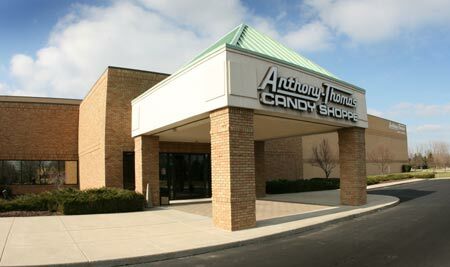 Using their first names, they formed the Anthony-Thomas Candy Company in 1952. In 1962 they expanded and moved to a 60,000 square foot building at 1160 West Broad Street. As business continued to grow, this building became too small to keep up with the demand. In 1995 Anthony-Thomas again expanded, moving to its new 152,000 square foot factory at 1777 Arlingate Lane in Columbus, Ohio which is on the west side of Columbus and can be seen from I-270. Besides making candy for 14 local retail outlets, they also have a fund-raising division and contract-manufacturing division. 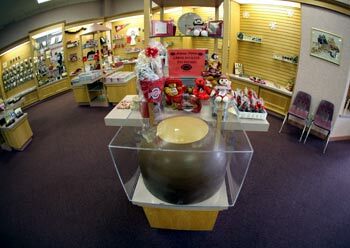 Today, they are one of the largest family-owned and operated candy companies in the Midwest. Thomas Zanetos still goes to work almost every day as do his sons who still manage the operation. 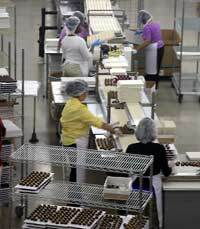 They employ over 200 people and produce an average of 50,000 pounds of chocolate a day. 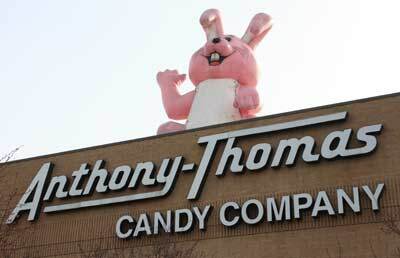 Anthony-Thomas sells its candies in 17 states and in over 600 Hallmark stores. Tours of the plant are conducted regularly just call ahead of time. Another favorite is the pre-Easter open house when on one Saturday, the plant tour is open all day, with free samples. 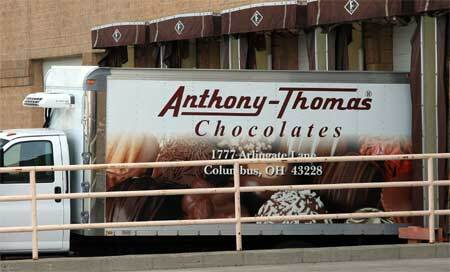 We are extremely proud of the fact that only the finest ingredients go into Anthony-Thomas Chocolates. 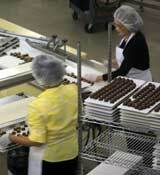 It is our goal to completely satisfy our customers with delicious chocolates and outstanding customer service. Our chocolates taste so good that we unconditionally guarantee your satisfaction. Factory Tours are every Tuesday and Thursday from 9:30 am. to 2:30 pm. The factory is open to free Motor Coach and Group tours of 10 or more Monday through Friday from 9:30 am. to 2:30 pm. by appointment only. Visitors walk along a glass-enclosed suspended catwalk in their state-of-the-art candy factory. For more information or to schedule a tour appointment, please call their toll-free number (877) 226-3921.